Outside my window, where I write, I have this view. Rosemary, morning glory, and a red geranium (it's a one-legged straggler!) peeping from the corner. I also have water available for the birds. The official blue water bath in the corner of the deck and then the black rectangle of water beside the morning glory box. This rectangle of water attracts sparrows. Is it something about it's shallowness compared to the bowl shape of the blue birdbath? You can see, in this photo, the drops of water from where several of them had had a refreshing bath before they took off when I invaded their domain! Hm? Yes. Back to the writing! What are your favorite summer lazy day images? I've felt unsettled for awhile. Certainly some of that is related to the political landscape here in the U.S. and also to worldwide environmental changes, including my battle with the non-native Japanese beetles eating my rose bushes. But the discomfort I'm experiencing is also about my own life, where I am professionally, and how I live within the circle of family, friends, and the ever enlarging society that I am a part of. So how am I coping? Not always wonderfully, that's for sure but I am learning what is helpful. I used to walk daily but I got out of the habit so I've taken up walking again, trying for 5 out of 7 days, 30 minutes minimum at least. I read Ed Heilman's facebook page yesterday about learning to live deeper and having an opportunity to dive deeper into life. I believe I do not solve my problems at the same level I used to create them. So for me, getting quiet, still, and inward, is letting a deeper reality transform my normal conscious reality. I was also inspired by this article by Rev. Lawrence Richardson, a writing and clergy colleague's church journey to Kenya, to the Daylight Center and School, and the way this is now shaping his approach toward church life and how we build community. Boundless Sea of Love and Energy, our future and our God, may all your dreams for us come true: your steady motherlike imaginings, and your fatherly hopes, your creative purposes evident everywhere in the world. Guide us to our truest selves, co-creators with you of this environment. It is such a joy to be part of this world. It's amazing how putting out a birdbath and having a garden gone a bit wild, will attract birds. I want to create habits that cultivate a positive attitude, so that I may have courage and fortitude to go out and be in the world as I am called to be. 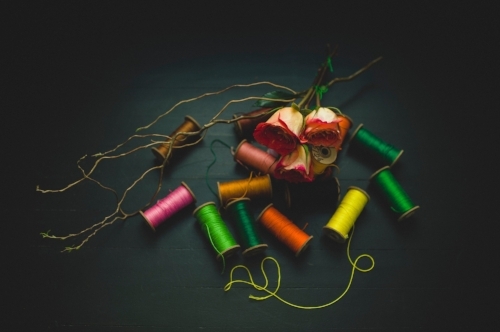 How do you nurture your self when the world or your life rattle your patterns? 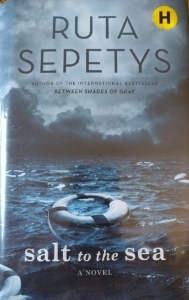 I started reading—Salt to the Sea by Ruta Sepetys--last night before I went to bed and I woke up early in order to finish it! Talk about a story that relentlessly pulls you into it. Placed in 1945, Salt to the Sea tells the story of the winding down of World War II from the point-of-view of four young people: a Lithuanian nurse, a Prussian art restorer, an intuitive Polish girl, and a German seaman. Three are refugees, fleeing eastward, caught between the Soviet Red Army and Nazi Germany. We hear bits and pieces of their secrets, their generosity, their mistrust. They link up with other refugees that the reader learns to care for: a wandering boy, a shoe poet, and a suspicious giantess. Their aim? To board the Wilhelm Gustloff, a ship to carry them away to safety. The Wilhelm Gustloff is one of the lesser known tragedies of WWII. Boarded in Gotenhafen, (present day Gdynia, Poland) with mostly civilians, it carried 10,500 people, with an estimated 5,000 being children. A Soviet submarine launched three torpedoes against it, killing an estimated 9,000 people. It is now a ghost ship, lying off the coast of Poland. In her book, Ruta Sepetys, a Lithuanian American, lists her face-to-face and book research sources. She met with a Lithuanian family and a Latvian couple who survived the sinking of the Wilhelm Gustloff and was in contact with more. She writes of her family connections—her father waiting in a refugee camp, hoping to return to Lithuania and her father’s cousin, who missed the Wilhelm Gustloff and sailed another ship. The hardcover book also has a 1945 map of the area and a present-day (2016) map. Many borders shifted after the war. East Prussia exists no more. Its port city of Konigsberg is renamed Kaliningrad and is part of the Russian oblast. The outer lands of East Prussia are now within the Polish border. Poland lost its east edge to the Soviet Union, which have now become the countries of Belarus and Ukraine. Not until 1989 did the Baltic States—Lithuania, Latvia, and Estonia—become free of Russian rule. This past week or two in the U.S. has been a difficult time, as I grapple with the images and articles of what's happening with asylum-seekers. Families were separated, parents from children. Even babies. And that's the most recent atrocity. We have, what one person termed on facebook, "baby jails." Some people are asking, where are the images for the little girls and girl babies in these detention centers. So far we only have images and audios of male children and babies. boarding school for Native American tribes, where we tried to eradicate the language and culture from their children. slavery for African Americans, captured and brought to our shores and as slavery established itself on our soils, selling children away from their parents. concentration camps during WWII to incarcerate Japanese-American families. Although the government has stopped separating families, due to protests, there are 2,000+ children who have been bussed or flown to various detention centers around the U.S., separated from their parents. Call or email our senators and congresswomen and men. Donate money to agencies that seek to provide legal representation and reunite families that have been separated. Some resources here. A more recent piece I read, suggested that instead of celebrating July 4, our Independence Day, we can mourn, reflecting on the reality of who we are today. Wear black. Hang no flags. Work for our candidates. Check on neighbors. Help the marginalized. Donate to charity. Feed the hungry. Work for change. Love one another. Whenever the news is discouraging, as in another school shooting or another black man is killed, my spirit shudders and wants to shut out what I see, what I read. Yet I find so much hope in our world. Whether it's the small things I do through kindnesses throughout the day or serving a biracial church that is building relationships of trust and compassion or whether it's the actions of other people: the young people speaking out against school shootings or black people and allies speaking out against the killing of innocent black men. I am fortunate to have thoughtful colleagues, pastors, in real life and on facebook, who give voice to their thoughts, who ground their thoughts in their theology, in their faith in God. Each faith tradition seeks goodness of the whole. If it does not, it is a cult. Muslims, Buddhists, Jews, Hindus, Christians, Sikhs move toward light, toward goodness along the path that each person has been given. Compassion is the heart, the center of many if not all of these traditions. Where hatred exists, there is fear. Fear of that which lies beyond our understanding. Or fear of being unlovable. Or fear that God is, indeed, a God who seeks justice. I speak from the Christian tradition, as a woman who has served as pastor. Too many times, we attempt to box God up, domesticate Jesus, pin the Eternal Spirit down. When it's convenient, we take God out of the box. Evil, via the urge to control, the urge to dominate, killed Jesus. But you know the story from the Bible, right? God will not remain in our human-made boxes. 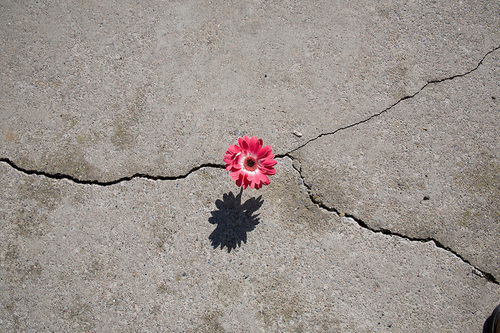 God is like that flower that breaks through the concrete. Jesus laughed and broke free of the concrete. God is the earth that shifts and shakes beneath us. God is the sun that shines upon us. God is the wind that breathes upon us. God is the rain that nurtures our dryness, our hollowness. We can argue with and fight against this unrestrained God all we want but God brings beauty forth from suffering, from violence. God does not cause the violence or the suffering but God is with us in the form of Shekinah, She who dwells among us, the radiance who flashes forth in our wilderness times. What does an active faith look like today? Some of us will read, offer prayer, teach/preach, raise awareness, inspire hope for the incoming of God's dream for our world. Some of us will support the women and youth, the men and children who march for a world that will be respectful of all people. Some of us will organize in our own towns, cities, villages to bring about awareness and justice for people who struggle against racial and/or economic injustice. Some of us will donate money to organizations that support our dream for a better world. Some of us will volunteer or apply for a paying job or create a consulting job for agencies that will bring about a more just world that shows compassion regardless of our gender, our skin color, our physical, emotional, or cognitive abilities. There is much work to be done. There is much dismantling that is happening. There is much building to do. Finding a faith community, where trust, education, encouragement, awareness, can be so helpful as we go about the work God has called us to do. I used to keep a gratitude journal, listing five things I was grateful for each day. It's a good practice. It's an easy practice for me because I have eternal hope. I'm an optimist by nature and I search for the good. Like the beauty in those 12+ inches of snow we received on Monday. This was actually the day after, when the sun came out. It's gorgeous, the crispness of the white snow against the deep blue of the sky. But it was also gorgeous when the snow fell--the softness of the landscape as the snowflakes feathered down and obscured sharp edges and grayed the day. I don't always want snow. Neither the gray snowy days or the crisp blue sky snow. But I love the differences. 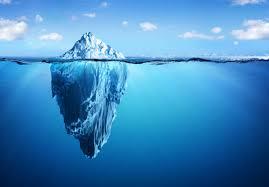 The changes intrigue me, make me notice new things, shake up my stagnant perceptions of the physical world around me. Right now, this is my favorite time of the year. When spring comes, that will be my favorite time of the year. Does that make me fickle? Or does that just make me appreciative?